The soil plays an important role in the environment. It is the fundamental interface where atmosphere, lithosphere, hydrosphere and biosphere are joining. The soil governs the elementary terrestrial cycles of living and dead matter. Plants are growing on the soil, it produces and stores plant nutrients, it contains and decays organic and inorganic matters and also produces new materials. The soil also controls the water cycle by overland flow or infiltration, storage and groundwater recharge. It also cleans the water by filtration, physical adsorption and biochemical decomposition. These and much more essential characteristics make the soil indispensable – and so we have to protect it. 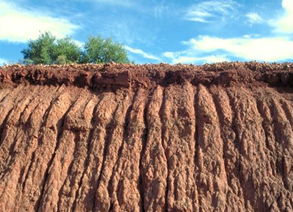 Never forget: If a soil is destroyed or eroded, it requires thousands of years for its new development. The purpose of soil protection management (like the German Soil Protection Regulation) is to protect or restore the functions of the soil. This includes prevention of harmful soil changes, rehabilitation of soil ,contaminated sites and waters; and precautions against negative impacts on soil.